Borange, a new app that just went live on Apple’s App Store, is looking to turn your iPhone into a casual social planner. 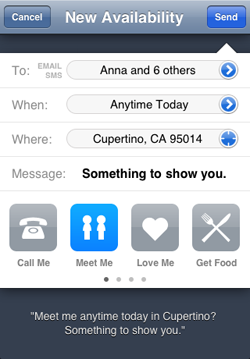 The application effectively adds a basic calendar function to the iPhone’s address book, allowing users to view a timeline that details when their friends will be free to hang out that day. You can download the 99-cent application here. Borange is very well designed, and feels like a natural extension to the address book. To get started, you scroll through your list of contacts, checking off the ones you’d like to send your availability information to (you can also send out mass notifications to groups or your entire contact list). 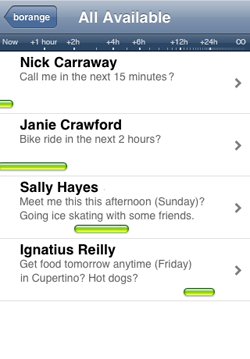 Contacts that are Borange members will see your available times listed as part of a comprehensive timeline that also includes schedules from their other Borange-using friends. Those contacts that aren’t using Borange will get their updates via SMS or Email, which include links to a map of your current location as well as your contact information. Borange is less impressive when you don’t have many friends using the iPhone app because the nifty timeline view becomes mostly useless, but it’s still an effective way to handle group messaging (and all outgoing SMS messages are free, as they are routed through Borange’s servers). There are a number of other apps available on the iPhone that are also geared towards helping users pair up with friends, but most of them just use GPS to tell you when you’ve got a friend close by and leave the logistics up to you. Borange has less of an emphasis on geolocation and is instead focused on streamlining the invitation process, which could make it a worthy addition to your iPhone. And even if you can’t get your friends to start using the iPhone app, it still makes for a great free mass text-messaging service. For more on Borange, check out their demo site.